I work at the Sydney Brain Bank, located at NeuRA and on August 12 this year I combined two things I am deeply passionate about: the hugely important work we do here at the Sydney Brain Bank….and running! I joined over 75,000 people and ran in this year’s City 2 Surf, a beautiful run that starts at Hyde Park in Sydney and finishes on the iconic shores of Bondi Beach. It is now the world’s largest fun run. If you were there you may have seen me in my eighties head and sweat bands – never let it be said that scientists don’t have style! 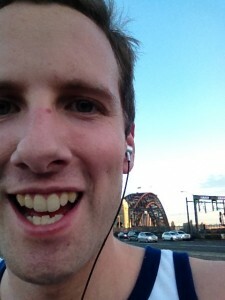 Training for the big race (that’s the Sydney Harbour Bridge in the background). Entrants have the choice when they sign up to run for fun or to run for a charitable cause. This has been a key facet of the City 2 Surf experience for some years now, 2012 was no exception with more than AU$4 million being raised for over 650 charities! This was my 4th year running in the City 2 Surf but my first running for a charity. It was a very easy process, all I had to do was select the charity I wished to run for when I signed up and that was it! I was pleasantly surprised to see NeuRA’s name listed on Everyday Hero amongst the very long list of charities. Since joining the Sydney Brain Bank at NeuRA at the beginning of this year I have seen first hand the dedicated team equipping researchers today with the resources they need to find cures tomorrow. This is done by collecting tissue generously donated by our brain donors, characterizing the tissue using the latest diagnostic criteria and histopathological practices and storing the tissue to be distributed to scientists all over Australia and the world. The dedication shown by the staff of the Sydney Brain Bank is easily matched by the willingness and determination shown by our brain donors. I have had the privilege to talk to some of them and hear their stories and this has only strengthened my resolve to work harder. My decision to run for NeuRA was in the end ‘a no brainer’ (excuse the pun). It was a hugely successful campaign, not only did I thoroughly enjoy the run, I ran a personal best of 87 minutes! This I believe could not have occurred with out the motivation, encouragement and support shown by my friends and family who generously donated to the cause, and for this I am truly thankful. 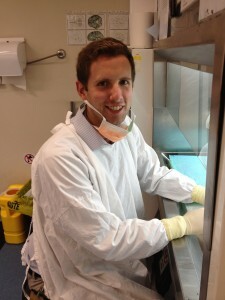 Andrew Affleck is a Research Officer with the Sydney Brain Bank at NeuRA.